Combine the vinegars in a small saucepan and bring to a boil. Cook until reduced by half, about 10 minutes. Remove from heat and add the basil leaves. Allow to cool. Pour this mixture over the chicken breasts and allow the chicken to marinate for 30 minutes. Prepare the vegetables and sauce during this time. Remove chicken from marinade and brown well on each side. Finish cooking in a preheated 350 degree oven for about 8 minutes. Let the chicken rest about 10 minutes. 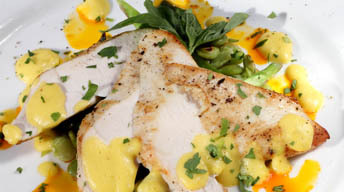 Slice each chicken breast at an angle into about 4 slices. Place a large spoon full of vegetables on each plate and fan the chicken on top of the vegetables. Drizzle the sabayon over the chicken and serve. Slice the asparagus diagonally into 2 inch pieces. Heat a sauté pan over medium and cook the asparagus and fava beans in olive oil until hot and tender, about 5 minutes. Add the capers and cook 1 minute longer. To prepare the sabayon, combine the shallot and 1 cup of the wine in a sauce pan. Cook until the wine is almost evaporated. Scrape this into a bowl and add the remaining wine, egg yolks, and olive oil. Place the bowl over medium heat, and whisk constantly until thickened and velvety. About 3 minutes. Adjust with salt and pepper.